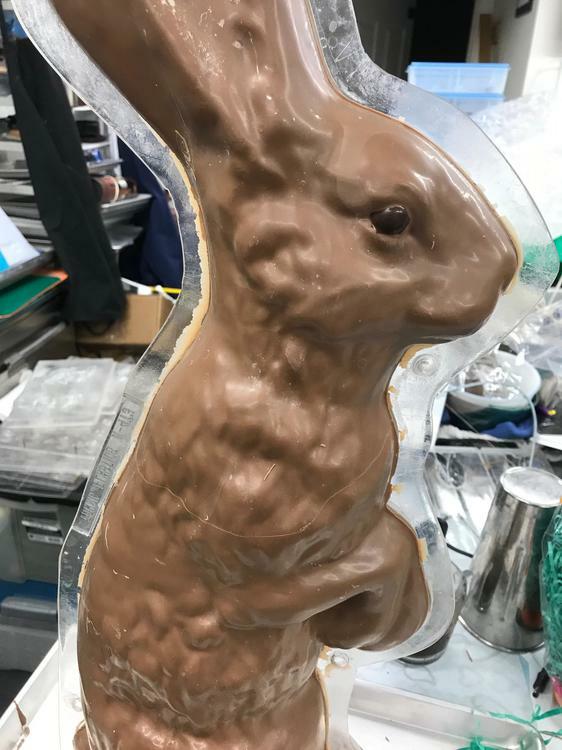 Can This Bunny Be Saved? The 3rd time wasn't the charm. My first go at the 24 inch rabbit resulted in a few holes due to weak spots and a couple of cracks. So melted down and tried again. Second time resulted in a similar result to the smaller bunny - only a few more pieces - so back into the Selmi it went. Third go - the fractures aren't circumferential so I can't just remove the head - fill it with something and glue the head back on. Doesn't really follow a nice necklace pattern to pipe some royal icing or thickened chocolate on it. Is that a Tomric mold? Would Brian have an idea? Might be. I'll text him. Forgive me if you mentioned it already, but what is your end result for this guy? A display piece? Customer? Only reason I ask is I wonder how strong the cracks and fractures are and how far will he be moved or in transit? 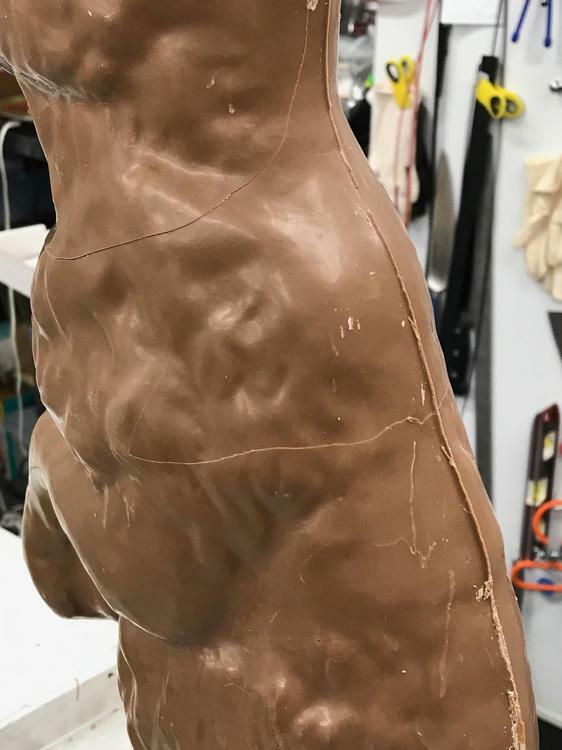 I know with chocolate showpieces that have some heft to them in thickness, I can use my hands (they are always hot) to rub out any seams, lines and fissures. With the thickness shown during the second casting, it looks thick enough to handle that. Of course, once you do that, it will be dull along those lines. Would painting a coat a la Peter Rabbit be a way to hide them after they are smoothed out? Women's auxiliary at the hospital to raffle. Probably won't do a lot of moving around once I get him wrapped up. He seems pretty stable when I tried to snap his head off. Painting won't give me shine either though. I'm wondering if I could fashion something in the way of a shawl. But not sure what I'd make it from. Perhaps I could mold it inside the mold itself then attach it to the bunny. Can you give it a heavy spray with cocoa butter for that flocked/fuzzy effect? Won't be shiny, but fuzzy is good on bunnies. Or a nice flowing cape out of modeling chocolate or sugar paste a la a superhero or little red riding hood. 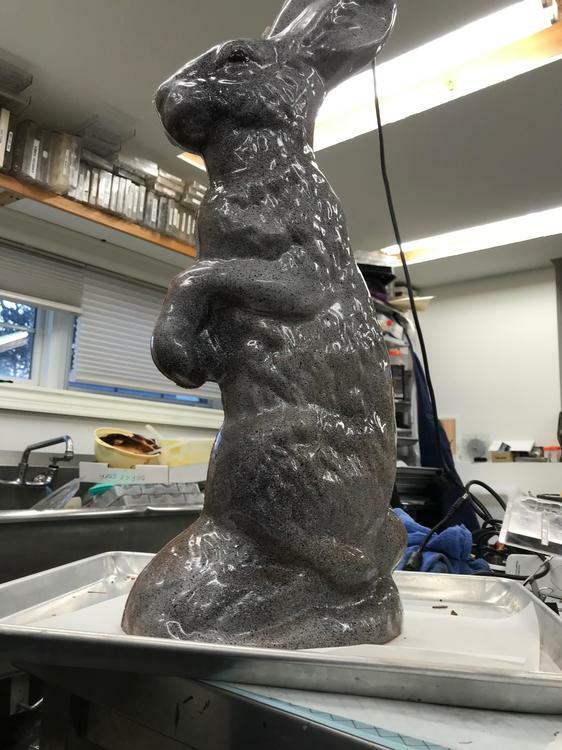 Haven't done a lot of work with sugar paste - or even modeling chocolate for that matter - but it would likely make a better cape than painting inside the mold. Given the size of him I'd have rough time time flocking him in my 'spray booth' but the thought did cross my mind. 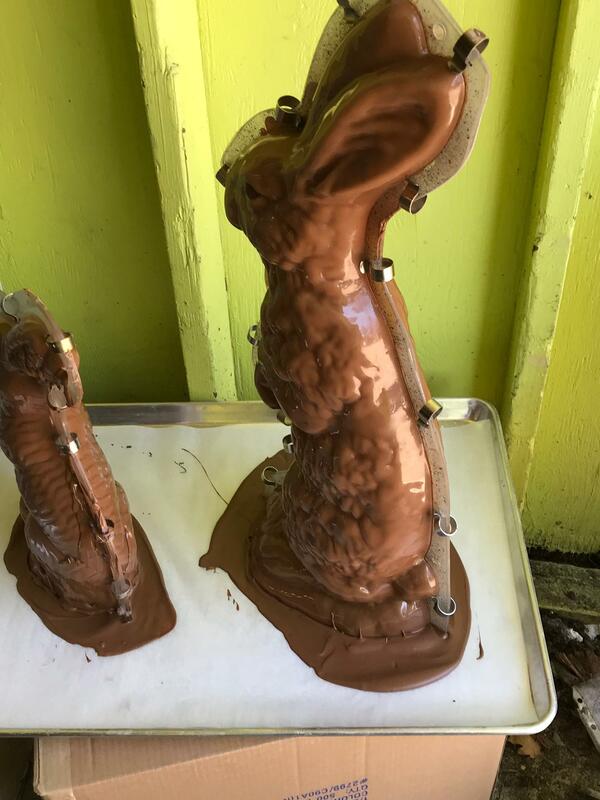 I was thinking molding chocolate too PG. The fuzzy effect is a great idea too. Everyone likes fuzzy bunnies don't they? I feel modeling chocolate would be your best bet. 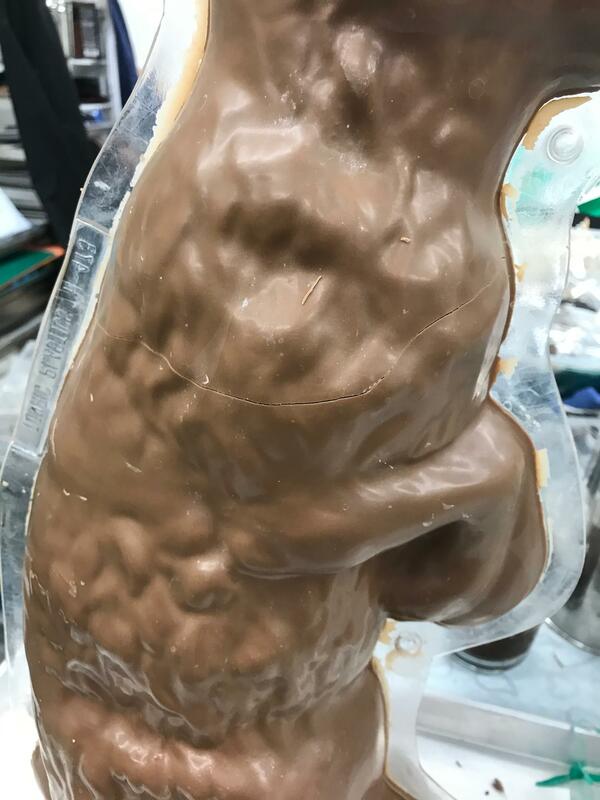 It fits the chocolate theme, it isn't so heavy compared to sugarpaste, taste is not off-putting like some fondant, and is very forgiving when it comes to shaping and sculpting. Make him or her thicker? Make him an apron with a grinning dog on it. Or one that says something stupid, like, "Eat the Cook" or "Warren Buffy" or "Crackhead." Looks like one of the bunnies out of Watership Down. Doesn’t seem to help - it’s a mold issue up to a point. He’s pretty thick - weighs a ton! Instead of flocking, you could fling colors all over it and Jackson Pollack the whole thing. Some drips might have to be more strategic than others. The Ladies' Auxiliary might not be the right audience, but you could make an Easter mummy - spread white chocolate on strips of acetate and wrap around. Trouble with flocking is it requires a frozen bunny. I have not got a freezer big enough to get this fellow frozen and it’s too warm outside now besides that it’s raining. I can't believe I'm about to say this because I generally tend to be a picky basta… err... fella, with my work but... personally, I'd probably just take a fine paint brush and some well-thinned melted chocolate and paint along the cracks then say "here you go Lady's Auxiliary" and watch them be thrilled. Have you had prior success with this mould? He is a huge bunny! How much does he weigh? No other suggestions for repairs but if you make him again perhaps you can try painting the mould with a layer of chocolate before you do your final fill and rotate. 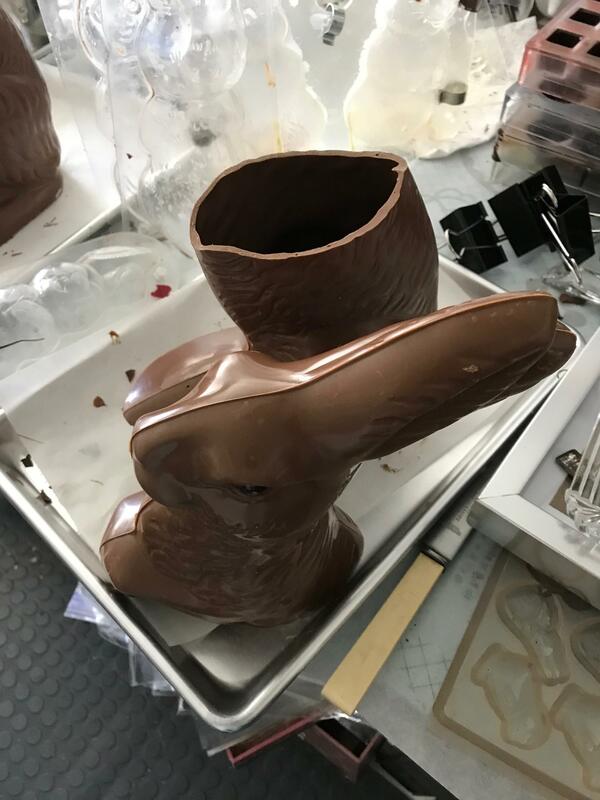 Hopefully we'll learn some additional tips at this year's eGullet chocolate workshop that will help you with next year's Easter bunny. Hmmm - wonder how I could get that rough gauze and plaster look with white chocolate? Can you affix a little backpack/basket to his back/front and pipe decorative straps to disguise the cracks? Sone sort of fine plastic mesh, like window screen or needlepoint/crossstitch backing, depending on whether the hardware store or the craft supply store is closer. or rough it up after with a stiff brush or towel.